A forklift driver, represented by McCoy and McCoy, was recently awarded $5.4 million after suffering from a forklift injury at work. Read more about this injury and verdict here. Forklifts may prove critical in the warehouse environment, but they can also be incredibly dangerous. Commonly cited Occupational and Safety Health Administration (OSHA) statistics indicate that accidents involving powered industrial trucks (such as forklifts) cause 85 deaths and over 34,900 serious injuries every year. Below, we outline the most common types of forklift injuries. Overturned Forklifts –A leading cause of forklift fatalities, overturn accidents may occur if forklifts turn corners too quickly or if heavy, uncentered loads disturb the vehicle’s balance. Overturns may also occur as forklifts travel forward or sideways down ramps. This could cause the load to tilt and make the entire vehicle unstable. Falls –Forklift falls commonly involve order selectors. These are specifically designed to lift individuals so they can manually load and unload items. In 2017, OSHA’s Fatal Facts outlined a devastating case in which a warehouse worker was fatally injured by a seven-foot fall from an elevated platform. This fall was prompted by the all-too-common practice of placing the worker’s feet on the pallet while handling inventory on the highest shelf. OSHA recommends that workers be restricted from occupying raised pallets. Additionally, OSHA suggests that proper equipment is used for raising workers. Forklift Crashes –If a machine begins moving unexpectedly or the area of operation is not properly cleared, people in the vicinity risk being struck or run over. In other cases, forklifts may run into other vehicles. Crashes involving stationary objects are no less dangerous. These collisions may cause items stored in the warehouse — or the shelving itself — to fall, potentially injuring or even crushing those standing below. Some conditions make accidents more likely. Poorly maintained surfaces, for example, increase the potential for overturned forklifts. Shelving height can also play a role in devastating incidents. Many home improvement businesses are notorious for stacking heavy items on high shelves, leaving forklift operators, other employees, and customers at risk. OSHA maintains strict requirements for forklifts, which are often referred to as powered industrial trucks. OSHA forklift regulations determine who is allowed to operate these vehicles — and under what circumstances. Those under the age of 18 cannot legally operate forklifts, nor can those who are not properly trained and certified. Training and evaluation requirements are thoroughly explained in 29 CFR 1910.178(l)(1). In addition to providing detailed guidelines regarding forklift driver eligibility, OSHA also provides fall protection standards. At the minimum, OSHA mandates that general industry workplaces provide fall protection for all elevations above four feet. Fall protection protocol could include the installation of guardrails, provision of personal protective equipment (at no charge to the employee), and, if necessary, the use of safety harnesses. 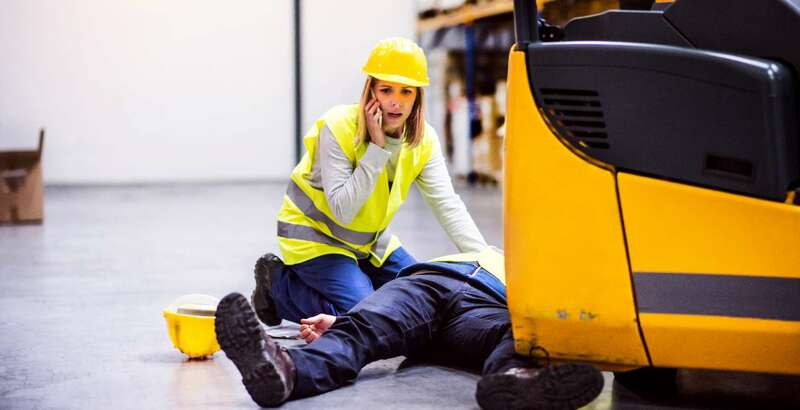 While OSHA and workers’ compensation programs offer valuable guidance and an element of protection, those harmed in forklift accidents often require more extensive assistance. Workers’ comp does not grant victims damages for pain and suffering, nor does it deal with negligence. These matters are typically addressed in personal injury cases, which grant plaintiffs the opportunity to recover the full range of damages they’ve suffered. Were you injured in a forklift accident? Someone else’s negligence may be to blame for your current suffering. Not only could this neglect cause you pain now, but accident-related issues could also prompt grief in months and even years to come. At this difficult time, you deserve quality representation from a forklift injury attorney who understands your situation — and how it can best be remedied. Our passionate legal team boasts considerable experience in the niche practice area of warehouse injuries. We’ll make every effort to deliver the relief — and justice — you deserve. Ready to get started? Contact us today at 860-200-2627 to chat with an experienced forklift injury lawyer. We help forklift accident victims all across the US and are prepared to fight for you to get you the most from your forklift injury claim.